The 28th Infantry Regiment was organized and mustered into Confederate service in September 1861, at High Point, North Carolina. Its members were from the counties of Surry, Gaston, Catawba, Stanley, Montgomery, Yadkin, Orange, and Cleveland. The unit moved to New Bern and arrived just as the troops were withdrawing from that fight. 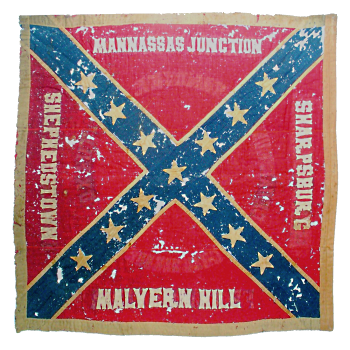 Ordered to Virginia in May, 1862, it was assigned to General Branch's and Lane's Brigade, Army of Northern Virginia. It fought at Hanover Court House and many conflicts of the army from the Seven Days' Battles to Cold Harbor. The 28th was then involved in the long Petersburg siege south of the James River and the Appomattox operations. It came to Virginia with 1,199 men, lost thirty-three percent of the 480 engaged during the Seven Days' Battles, and had 3 killed and 26 wounded at Cedar Mountain and 5 killed and 45 wounded at Second Manassas. The regiment reported 65 casualties at Fredericksburg and 89 at Chancellorsville. Of the 346 in action at Gettysburg, more than forty percent were killed, wounded, or missing. In Appomattox, the unit surrendered 17 officers and 213 men. 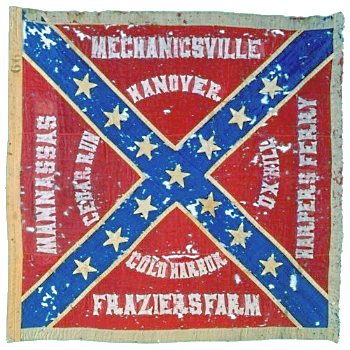 The flag of the 28th Regiment bore the names of many famous battles in which its men took part (based upon battle honors listed for the 28th's flag captured/surrendered, April 1865): Hanover, Mechanicsville, Cold Harbor, Frazier's Farm, Malvern Hill, Harper's Ferry, Shepherdstown, Fredericksburg, Sharpsburg, Wilderness, Chancellorsville, Gettysburg, Falling Waters, Cedar Run, Manassas Junction, Manassas Plains, and Ox Hill.